Though lifted straight from Titanic, this is one of my favourite everyday looks (though the term “everyday” is rather misleading in that it implies I do this everyday, which I most certainly do not as I cannot be bothered). I use my homemade make-up almost entirely to do this, and the end result is refined without looking overdone, just like Rose. Excellent. This is the look I used for my Grazia magazine shoot. This entire look is very matte, so make sure you aren’t using anything with glitter in it. Glitter is very un-1912. Begin with a clean face. 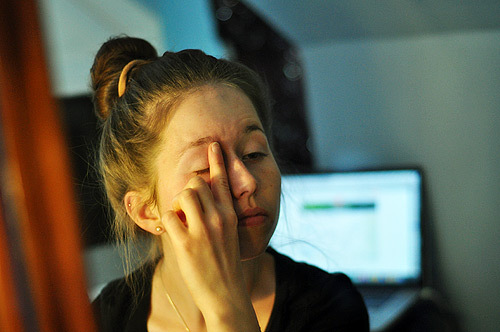 Spread a small amount of primer across your eyelids and up to your eyebrows. You’ll want something that dries matte and clear. I used Eye Kandii Cosmetics’ B-Primed eyeshadow primer. 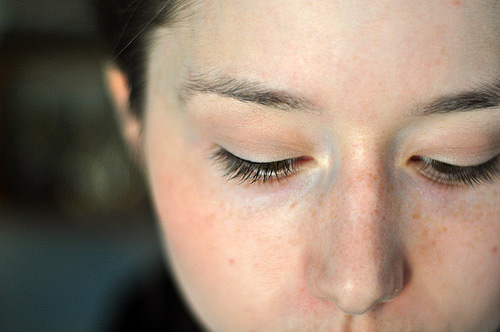 If you have any blemishes you need to cover up, now would be the time to do that, too. Next up, mineral make-up. You’ll want something on the paler side, as Rose wasn’t exactly sporting the Jersey Shore look. I used my homemade mineral make-up, which matches my skin tone perfectly… which works, because I am roughly as tan as a bedsheet. If you have more colour than I do, you may want to select something a bit paler than you are. 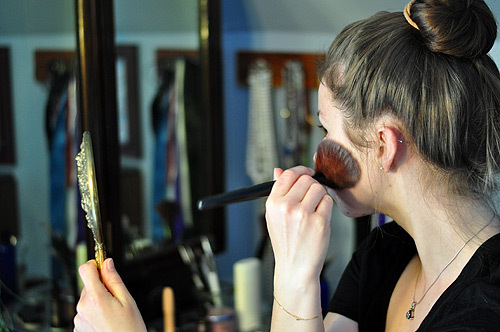 Get some on your brush, tap it off, and buff it into your face using circular motions. Be sure to cover your entire face (I often miss under/around my nose and the edge of my face). 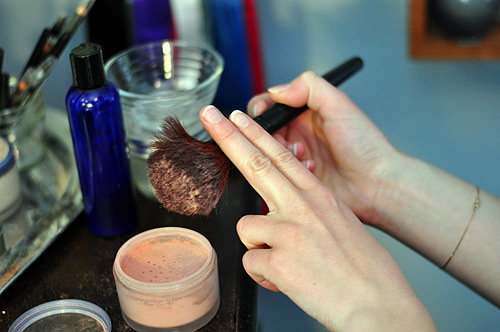 You should not look all powdery if you do it properly. 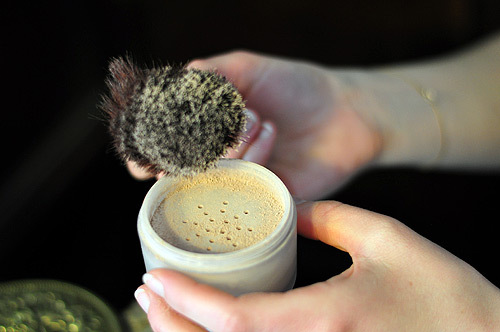 If you do look powdery, tap your brush empty and buff off the excess. Next up, blush. You’ll want something that’s a nice coral colour. 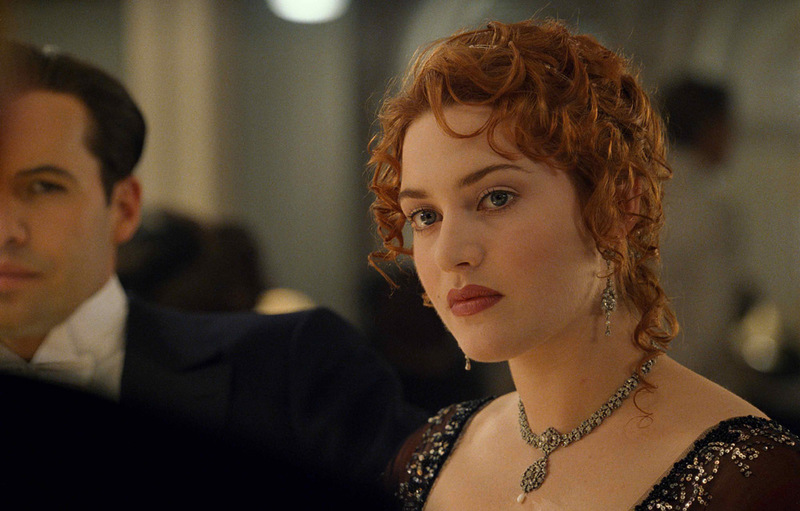 Rose didn’t wear bright red or pink rouge; hers always had a bit of orange in it to tie into her hair colour. I made my own. 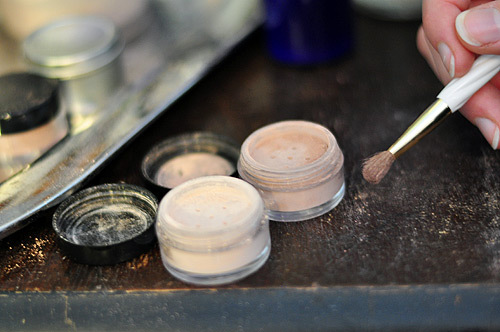 Be sure to tap off any excess if you’re using a loose powder blush. 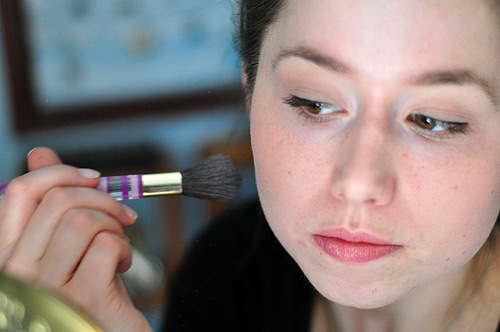 Lightly apply to your cheekbones. The shape should be more of an oblong oval than a circle. You’re not going for the circus clown/china doll look here. 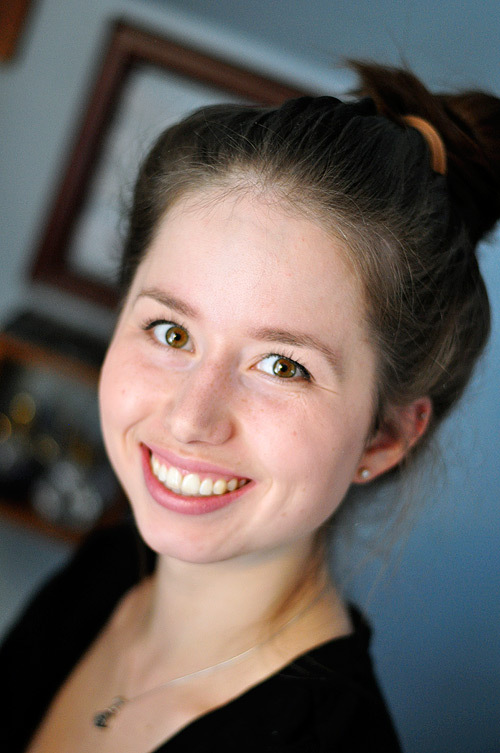 Don’t overdo it, either—you just want a bit of natural looking colour, nothing more. 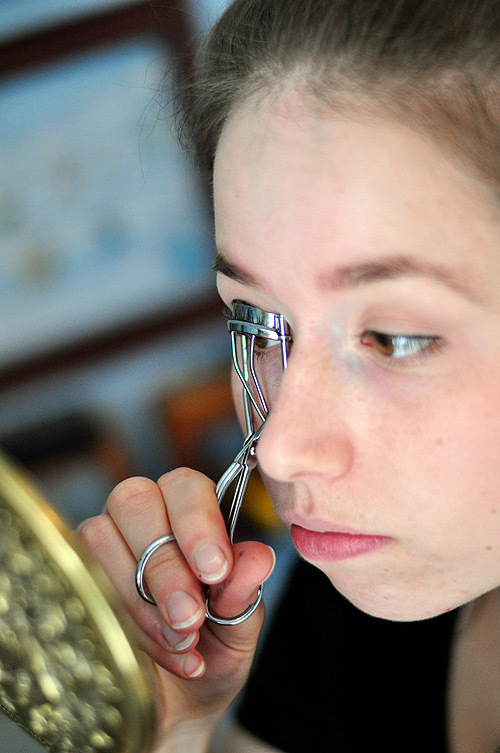 Now it’s time for eyeshadow. 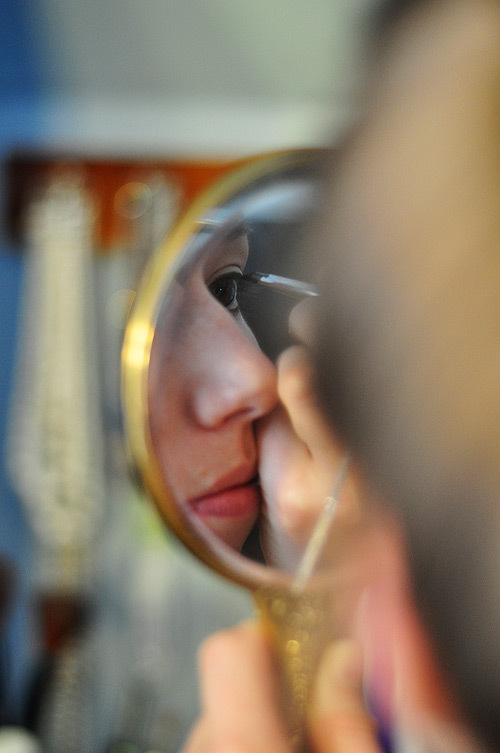 You’ll need two shades of matte eyeshadow; one a bit lighter than your skin, and one a bit darker. I used my own homemade eyeshadows, so the colours were perfect for me. 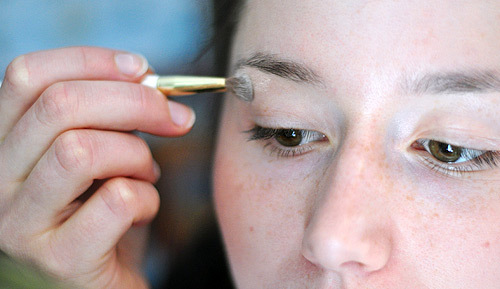 Apply the lighter shade generously across the lid and up to the eyebrow using a fluffy eye brush. 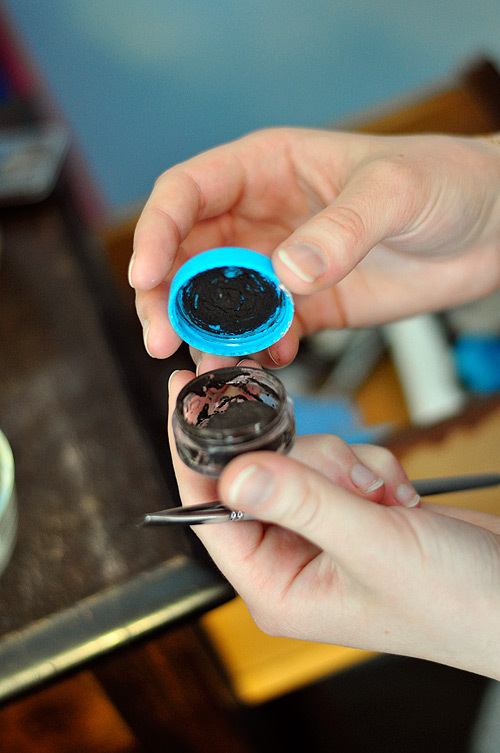 Apply the darker shade across the lid, stopping at the crease. Leave no harsh lines between the dark and light. The final effect will be very subtle. 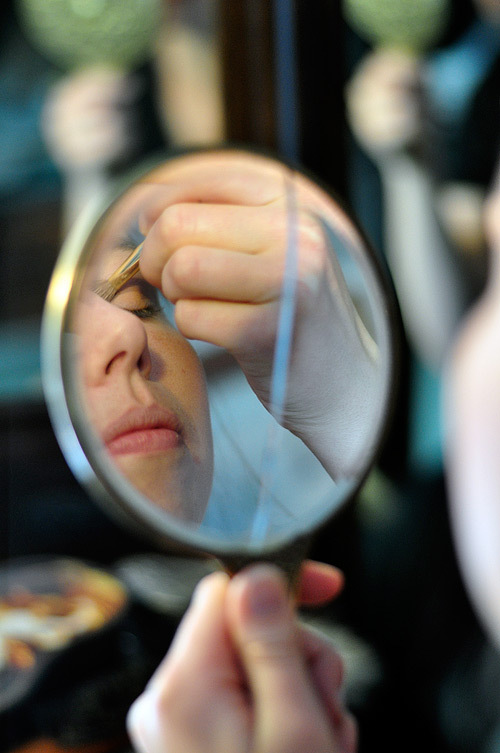 Now we line the lower lash line. 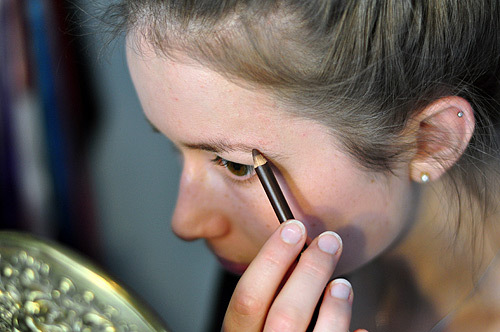 Using a brown eye pencil, dot along the outer third of your lower lash lines and then smudge together with your finder to create a lightly defined lower lash line. Up next; top lashes. 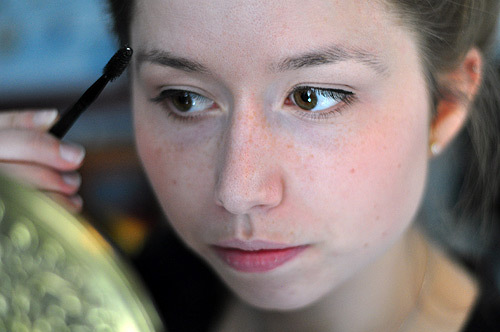 Rose uses a liquid liner in a very fine line. I prefer water activated liquid liner for this because it gives you infinitely more control over the consistency of the liner, lessening the chances of inadvertent semi-permanent screw ups. I used a liner from Eye Candii Cosmetics. It was a gel liner, but it dried out after a few months, and is now my favourite water-activated eyeliner. I think I like it better this way. 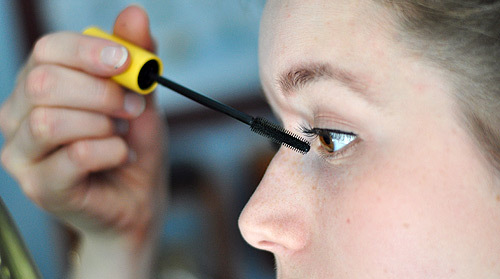 Thinly line the upper lash line, flaring out a wee little bit towards the outer corner. You’re going for the thinnest line possible here. Definitely not anything close to a cat eye. Now for eyebrows. These are very important as you need something defined to arch at poor people disapprovingly (jokes, of course). 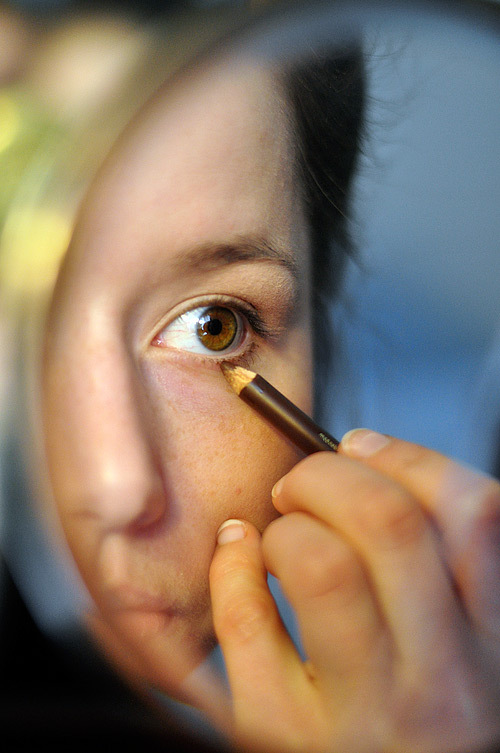 Brush your brows down and inwards, and then fill in with light stokes of a brow pencil (or the same eyeliner you used earlier if you can’t be bothered to own both, like me). 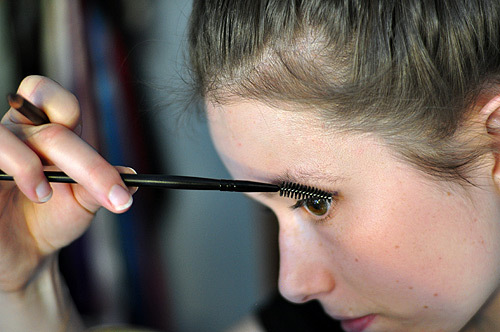 Pencil in the shape you want your brows to have (within reason, obviously; this is not magic), and then comb your brows back out over top of the pencil. Give everything a good comb to blend it all in so you can’t see the pencil. Now for eyelashes! First off, curl those bad boys! And mascara! Rose has very separated, sparse lashes. Now, I’m not about to thin out my eyelashes to match the look, so I just went for the separated bit. 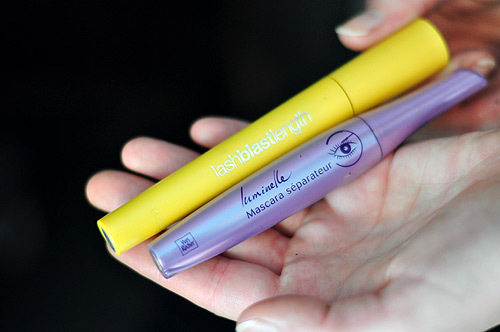 I used two mascaras to get the look: Covergirl Lash Blast Length and Yves Rocher Lash Seperating Mascara (discontinued). Use the lengthening one first, then the separating. The separating one is wetter, so it goes on over top of the drier lengthening one easily. Lastly, lips! You’ll want a matte lipstick in the dark purpley/red family. Choose something that works for you (or just something you have). Rose’s lipstick got darker as the day went on, so her lips were pretty red for this scene. Start with lip balm to soften things up. 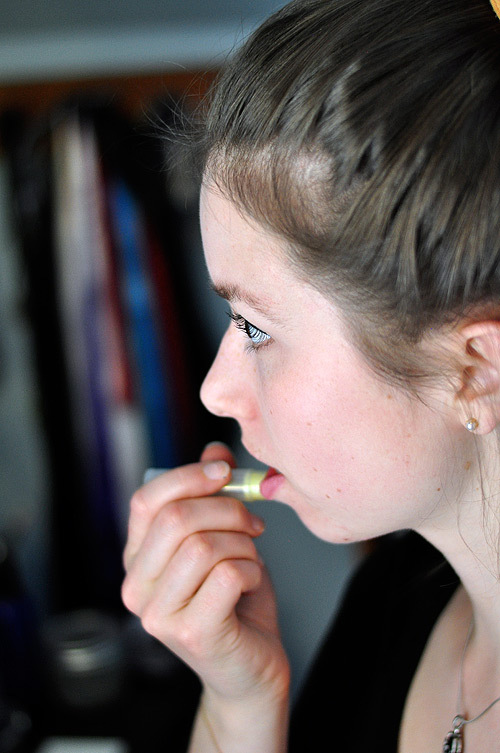 Then grab a lip brush and apply three layers of lipstick, giving it time to dry between applications. 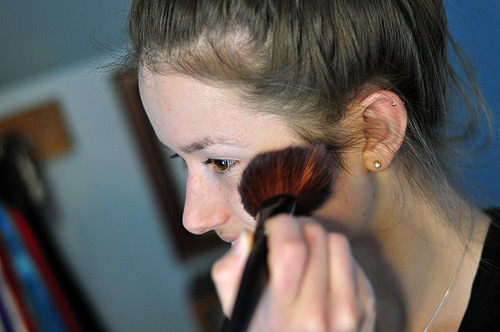 Finish off with a dusting of setting powder. I used silk powder, but cornstarch also works really well. All photos by my lovely & talented friend Hannah P.!